I had all but forgotten that I'd signed up for The Latchkey Project, until yesterday, when this envelope dropped through my door, protected by a UPS envelope. I've just had a lovely time opening it and sifting through the contents. What a delight! 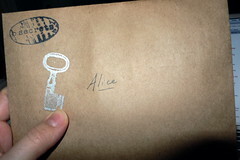 A hand-addressed and stamped envelope, containing a Key on a string, a Clue with a hand-written note addition, a Note with a hand-written outline and some further clues, an Instructions card and a Label, from which my pretty little key was dangling. Where to start? My key was found jammed inside the coin return of an old Laffing Sal machine. Maybe there..